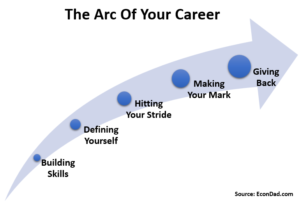 Lately, I’ve been thinking about The Arc of a Career, the different phases of work over our lives and how we can focus on what’s most important in each phase. 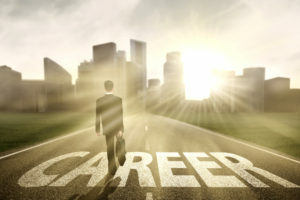 How do we define the phases of a career, exactly? Years 1-5: Building Skills. 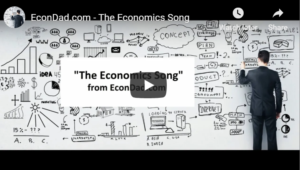 You’re right out of college (or high school, or graduate school), and you think you know a lot, right up until you start working and you realize you know almost nothing. You’re struggling to get by, to understand how things work, to make a contribution. In this phase, you should be doing all you can to build your skill set and pursue opportunity for learning. Do extra reading, take classes, get feedback, try different things, identify your strengths, hone your abilities. Make sure that your work is helping you learn the kind of skills you want to develop long-term. If you’re an extrovert, seek experiences interacting with others. If you’re a thinker, sharpen your mind with analytically challenging tasks. If you’re a creative person, put yourself out there and find a mentor for feedback. Whatever your path, climb the learning curve as quickly as possible. Years 6-10: Defining Yourself. You’ve been working for 5 years, and now you need to define who you are as a professional. 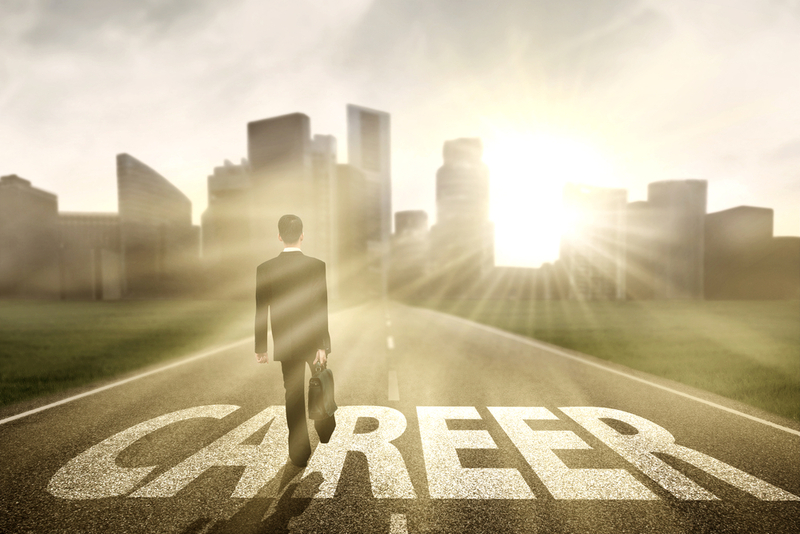 What kind of career do you want to pursue? What kind of job matches well with your abilities? After a few years of working, you realize that all the options are no longer open to you. You can’t suddenly switch from accounting to teaching, from television to professional sports, from medicine to law. Your options have narrowed, but your potential has increased. Now is time to figure out who you are and what you want. Identify what you value, what you’re good at, and find a niche with strong supply (i.e., you like the work) and strong demand (i.e., the market needs your skills). Find who you are and what kind of professional you want to be. Years 11-15: Hitting Your Stride. You’ve been working for 10 years now, and you have some expertise. People ask for your opinions and input, because you know what you’re talking about. You’ve been there, you’ve done that. You’ve reached your 10,000 hours to become an expert (1,000 – 2,000 hours a year × 5-10 years should do it). Now you’re hitting your stride and making an impact. Maybe you’re the Vice President of an important company branch. Maybe you’re senior staff at your non-profit. Maybe you’ve even started your own company. Whatever you’re doing, you’re now in a position to make a difference, to make an impact, to influence where time, energy, and resources are devoted. Now’s the time to hit it your stride and to make a positive difference in your organization and the world. 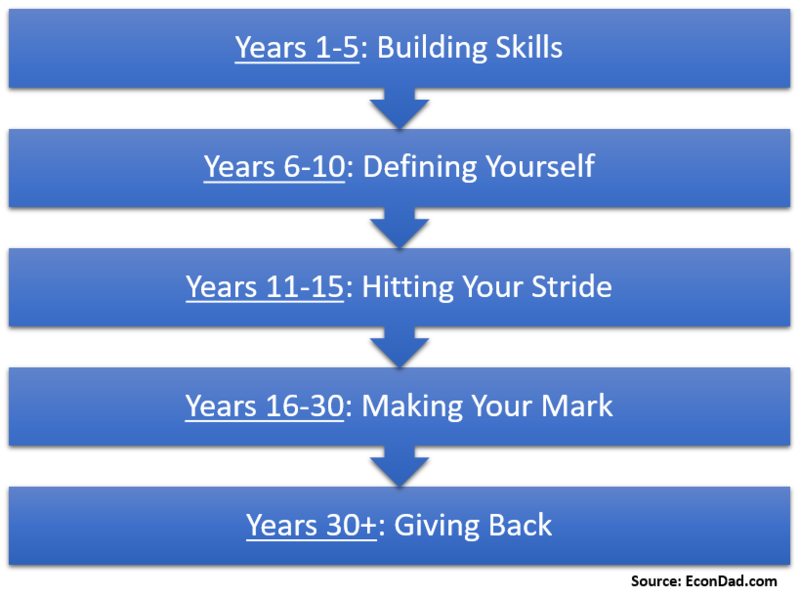 Years 16-30: Making Your Mark. You’re established. You’re an expert in your area. You continue to make a bigger impact each year you’re working. Now is the period of your arc where you make your mark, your professional impact, and you work to further the objectives, ideals, and pursuits that you find worthy of your life’s work. Colleagues look up to you, the market respects your worth, and you feel good about the work you’re doing. You try to record some of your best principles of work and life, your best ideas, to share with the world and, if you can, make a real difference in the lives of others. Perhaps I’ll have a finer breakdown of these years once I’ve lived them personally. You make your mark by creating or progressing in your area of expertise, and you feel great doing it. Years 30+: Giving Back. You’ve made your mark, and now is the time of your career to give back. There are plenty of young people who want to listen, to learn what you know, to accomplish what you’ve accomplished, to be like you. So you give them your time, attention, and wisdom. You help them make good decisions based on your experience, saving them years of time. They feel good, you feel good, and you get to share stories about how you used to crush it in your prime. This occurs at all levels — from the top of the pyramid all the way down, offering advice and giving back to people following in your path, at whatever level you’re at. You have a real opportunity to give back and help younger colleagues climb the mountains that you’ve climbed, a chance to stand on your shoulders and see further than they could without you. In the words of Ray Dalio (paraphrased): “In the first third of your life, you work and you’re supported by others. In the middle third, you work and you support others. In the final third, you savor life and enjoy all it has to offer.” (source: Tim Ferris Show). I love thinking about the timescale of a human life. I love looking at the long game, taking a step back, seeing the big picture. Remembering what lay behind us and dreaming about what lay before us. Appreciating the journey. Readers: Do you have any other lifetime arcs that you love? Send them my way, and I’ll post them here! For my 10-year wedding anniversary this year, my wife made a video of our first decade of marriage together. It was full of pictures and songs and time passing at the speed of 2 minutes per year. Our children were literally growing up before our eyes. I teared up, and loved every minute of it — all 20 minutes! 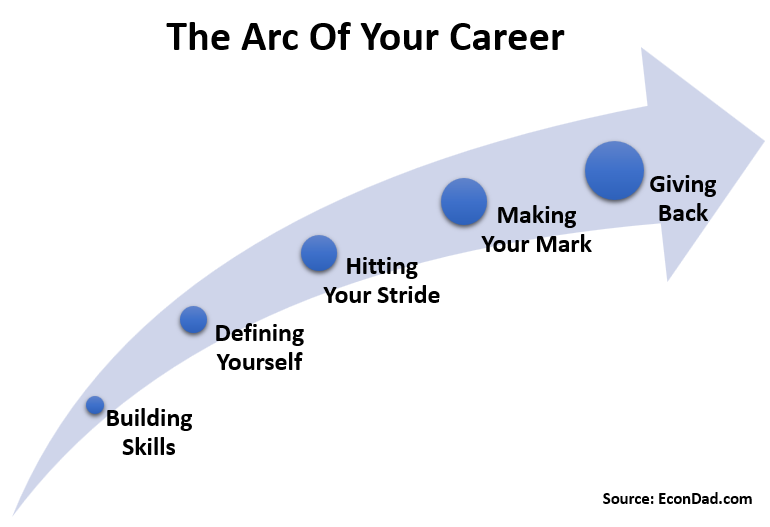 It’s meaningful to take a step back and examine the arc of your career and your life. 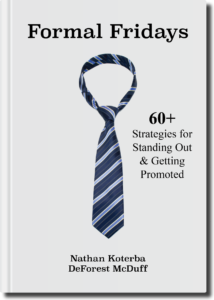 Not only is doing so strategically beneficial, but it reveals your career’s beauty and contribution. In the grand scheme of things, your life and your career are temporary but beautiful, like a shooting star in an otherwise vast universe. I hope to see a summary film of my career one day, when I can reflect on the phases I’ve gone through and the arc that I’ve created. For now, onward and upward! Hi Mike! Great question, and it highlights that the career phases aren’t one-size-fits-all. For physicians, I think much of your career is already focused on *serving* and *helping others. * You’ll already derive significant career satisfaction along the way, just by doing your job well. For *giving back*, maybe that’s less of a stage for you and more something that you just do along the way. Or, think about compressing the timeframes — because physicians build so many skills and identify their goals in medical school, you’re really hitting your stride and making your mark sooner. The point, perhaps, with Giving Back after 30+ years is that most of us probably need the paycheck less at that point; we’re working to make the world a better place. And hopefully it’s a blend along the way. Hope this helps and thanks for reading!